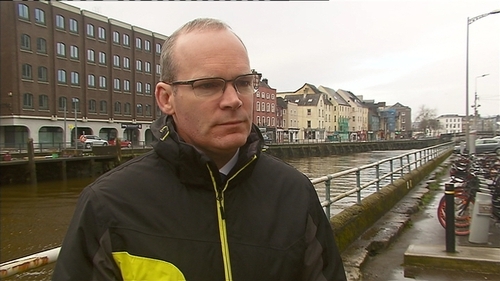 Tánaiste and Minister for Foreign Affairs Simon Coveney has said Theresa May’s plan to ensure the continuation of a soft border could be rejected by the European Union. The British Prime Minister has committed to leaving the EU customs union which guarantees tariff-free trade, but insists a hard border can be avoided through technological solutions and placing no new restrictions on the 80% of cross-frontier trade carried out by smaller businesses. However, Minister Coveney told BBC One's The Andrew Marr Show he was "not sure that the European Union will be able to support" the plan, as it would be worried about protecting the integrity of the single market. "While of course we will explore and look at all of the proposed British solutions, they are essentially a starting point in negotiations as opposed to an end point," he said. Mr Coveney said if agreement cannot be reached during talks between the UK, Ireland and the European Commission, the backstop plan of full British alignment with customs union and single market rules that Mrs May "committed clearly" to in December would have to be put in place. In a Brexit speech on Friday, Mrs May rejected "unacceptable" EU proposals to retain customs union arrangements in Northern Ireland, but accepted the UK's "responsibility" to help maintain a soft border - spelling out in detail how she believed this could be achieved by technological means or through a broader trade agreement. But Mr Coveney said: "This isn't a question of either side wanting to put up borders, but if you have to protect a functioning single market, just the same way Britain wants to protect its own single market, well then you have to understand that if goods move from one customs union to another then there needs to be some checks unless there is some mechanism that is negotiated and put in place that prevents that." He said the Irish Government is seeking a "better solution" that applies to all the UK and so the trade that occurs today can be maintained. He added: "Brexit was not the choice of the Irish people, it was the choice of the British people, so there is responsibility that the impact of Brexit on its neighbours is managed." Mrs May said she was pleased that Taoiseach Leo Varadkar had agreed to form the three-way talks to look at her proposals. She declined to defend Boris Johnson's comparison of the border to crossing between London congestion zones in Camden and Islington, but insisted both of them are "absolutely clear" that there will not be a hard border. "We've got proposals as to how we're going to achieve that, now we're going to be able to sit down and talk with others about how we're going to do that," Mrs May said. The European Commissioner for Agriculture and Rural Development, Phil Hogan has said it was now known that the British Prime Minister, Theresa May wants a free trade agreement between the UK and the EU, somewhere between those existing with Canada and Norway. Speaking on RTÉ's This Week programme, Mr Hogan said the speech delivered by Mrs May in London on how she envisaged the future relationship between the United Kingdom and the European Union post-Brexit was a big step forward in many areas. Mr Hogan said he shared concerns voiced by Taoiseach Leo Varadkar that the British government still did not appear to appreciate some of the constraints of leaving the European Single Market and the Customs Union. He said Mrs May had given more detail in the latest speech and indicated her intention to concede some ground in relation to the European Court of Justice, paying into the agencies, regulatory standards and developing some kind of customs arrangement. Mr Hogan said that in relation to the border issue, the talks are still at the point of principles only and the key issue is how to achieve a soft border and there has been no detail on how to achieve that from a UK perspective.